Prince Garrik is the Heir Presumptive of Altan, next in line to be crowned Wytch King. There’s only one problem: in order for Garrik to be crowned, he must possess Wytch power of his own, and thus far, whatever power Garrik might possess has shown no sign of awakening. As things stand, it is Garrik’s younger brother, Jaire—a dreamer completely unsuited to wear the crown—who will take the throne after their father. Things come to a head when the Wytch King, who has grown increasingly impatient with the situation, demands that Garrik’s power be forcibly awakened. Hoping to protect his brother from the burden of rule, Garrik allows the attempt—with disastrous results. Now, Garrik must learn to control the fiery dragon that rages within him before he destroys everything he loves. Wytch Master Ilya has been alone for years. Learning to control the icy beast slumbering deep within him has already cost him his family and his lover, and Ilya will never open himself up to that kind of pain again. Summoned to Altan to avert disaster if he can, Ilya has no intention of allowing anyone to thaw the ice in his heart. When he meets Prince Garrik, sparks fly, and Ilya finds himself fighting feelings he’d thought long buried. Can Garrik’s fire melt Ilya’s icy heart? Or will Ilya be forced to use his ice to quench the flames that burn within Garrik once and for all? And this...this is how you do dragons! Now if it's not already clear let me start by saying..."I LOVE DRAGONS!!! Unashamedly, unapologetically love them." to me they are the most fierce, majestic, powerful and yes scary because...hey, big fire breathing creatures here, in all of mythology. I've had this series on my wishlist for ages and was fortunate enough to have been gifted with the first three books in this series as part of a gift exchange last Christmas and while it's taken me until now to find the time to start reading this series...all I can say to that is good things come to he, or she as the case may be, who waits. Gerrick is the heir presumptive to the throne of Altan (next in line for the throne)...except there's one teensy little problem in order to become the Wytch King he needs to come into his wytch power...he's 20 it should have happened by now and Altan has never had a king who didn't possess a wytch power...ask his Uncle. He's only to happy to explain this to anyone who will listen...bitter much? Oh yeah. For Gerrick this isn't about being king though it's about keeping a promise. A promise to protect his younger brother, Jaire from the pressures of ruling a kingdom. Something that even Jaire willing admits he has absolutely no desire or ability to do. Regardless of everything else Jaire, Gerrick and their father are all of a like mind on this issue...neither the kingdom nor Jaire would survive should he be made king as the Wytch Council would have happen. It's in a last ditch effort to have Gerrick declared his rightful heir by the council that the king demands that Gerrick's wytch powers be forced to awaken defying the councils decree that forcing wytch powers or even attempting to do so is a punishable offense. Desperate to protect his brother Gerrick agrees to allow this. Some wytch powers are not meant to be awakened and when Gerrick's awakened powers end in disaster. Kian, Gerrick's friend, lover and an apprentice healer flees to the Wytch's College in search of the Wytch Master Ilya in a last ditch effort to save not just Gerrick, but his brother Jaire and ultimately the kingdom of Altan. Ilya's tasked with teaching Gerrick to control his powers but things get complicated when Ilya and Gerrick are drawn to each other and time starts to run out when the machinations of others put both the king and Jaire at risk. 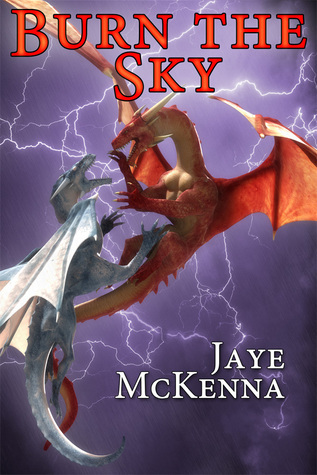 'Burn the Sky' is definitely one of the most enjoyable dragon stories I've read in a very long time. I loved the characters of Gerrick and Ilya. Their relationship started out with definite touch of antagonism as both men came into the relationship with some pre-conceived ideas about the other, but with Gerrick needing Ilya's help to learn how to control his powers and Ilya determined to avoid being the one to deliver the deathblow that will be Gerrick's fate should he fail they find themselves forced to find a way to work together for their own good and the good of a kingdom. Along with Gerrick and Ilya we are given some secondary characters who beg for their own story and fortunately the author has seen this. In 'Blackfrost' the second book in this series we are given the story of Kian and what becomes of him after he leave the college, in the third book 'Shadowspire' we find out more about Jaire, the sweet and sensitive brother of Garrick whom we met in this story and who proved that while he may not have what it takes to rule a kingdom he had the courage he needed to help save it. Dragonwatch is the fourth book currently released in this series and while we haven't met either of the MCs in it I'm so looking forward to what comes next in this series. For me the 'Wytch King' series is everything that I want in a fantasy series...there are dragons, magic, adventure, romance, characters that are both intriguing and compelling and a story that while it feels complete leaves me both wanting and knowing that there is yet more to come.